Zeppelin has been a pleasure to work with, he is beautiful, as most Friesians are, and very smart as well. Because he is going to be a driving horse, as well as a riding horse, the training has to taken on a new direction that I haven’t had the opportunity to teach Sandra Beaulieu. Sandra is his hands- on trainer under my direction. We split his training into five different phases. Phase One: We still begin with free lungeing with his side reins and Sandra doing at liberty half halts. Zeppelin loves this part of the training as he is able to receive treats. These are limited in his driving training as you can’t stop, jump out of the cart and hand your horse a treat. Phase Two: Then we move on to long-lining. He has learned to make figure eights at the trot, and this last session we added ten meter circles. Sandra has learned to change direction on the long lines with ease and grace, never losing the rhythm of his stride in the trot as they do the figure eight. This takes skill to be able to change rein across the diagonal and to teach the horse to make the turn. Sandra has been studying with me in dressage for some years and her skill at half pass on the horse’s back serves her well in learning these turns. It takes a slight sponge of the rein to create an inside rein on the turn and then to use the outside rein to turn with. Most driving needs a half pass to control the horses turns, rather than a leg yield. Phase Three: Next Sandra ground drives. He is doing quite well. In the beginning the challenge is to travel straight without wandering, as we want him to be able to pull a cart straight. A little half pass comes into play to teach straightness. After three short lessons, over three days, of about ten minutes each, he is now traveling straight and halting and learning to stand very still. Phase Four: Next we put Zeppelin on the lunge line, as he was taught during the initial training, before he learned to long line. Now we reverse the order during his lessons. He knows how to lunge, but it is still part of his training to prepare him for riding. Sandra lunges him a few minutes on each side and then we have a rider mount him, and they continue on the same pattern of twenty meter circles in the middle of the arena. He is already used to the routine and has no trouble continuing when we stop and add the rider. 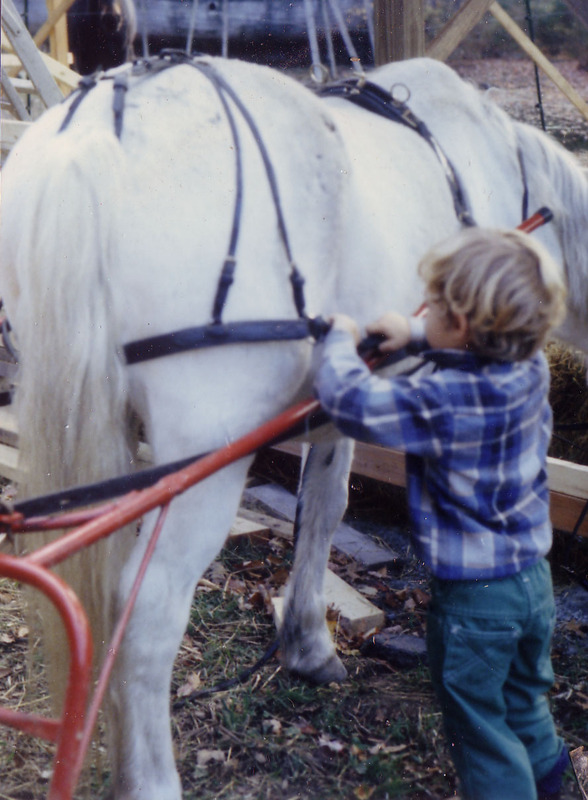 In the beginning we would have someone mount him at the bleachers, which is our station for working with horses before beginning riding or training. There he would eat grain as we had a rider mount him. Once he adjusted to the weight of the rider, then Sandra would lead him around, again distracting him from the difficulty of managing the weight of a rider on his back by offering treats. Now he has moved on to carrying the rider on a lunge line at the trot and without any treats. Sandra is managing the lunge line to make sure he is safe for the rider. The rider only has to hold on to pommel of the saddle and do nothing but go along for the ride. All cues are given by Sandra as she lunges Zeppelin. Doing five phases of training keeps the training session interesting for the Zeppelin and we are able to add something new in each of the five training session. This way he learns new things each day but it seems like so little as it is broken up in each phase of the training. Sandra is becoming a proficient driving trainer and I think she will be bitten by the driving passion before we are finished. I had Angela ground drive Elektra again in straight lines and in the end I took up th e reins and asked for turn on the haunches again, which is really a half pass in place. Then I asked for wider turns on haunches, as if there was a cart behind her. Their lesson for the day was understanding the inside and outside rein and how to use each of them effectively in a turn on the haunches. Both Kaylee and Angela asked lots of questions and understand it quite well now. Photo insert is my son Justin who did a lot of driving with me when he was young. He’s now grown, married and is an electrical engineer. Well, I have decided to begin driving again. Session One: Two of my students, Angela Bonacasa and Kaylee Clark, want to learn to drive. Eleckra, whose dam was a thoroughbred and her sire was an Oldenburg/Cleveland Bay, a little driving blood there. She was born 2003 and is the black horse pictured in the background of the picture of Deanna Thompson in the blog below, under “Deanna Lectures at the University of Maine. She has had three sessions so far. Session one: At the Walk: Introduced her to the long-lines and she was undaunted by them and I went on to ask for changes through the circle and she did them quite well. I had Angela take up the reins and try to steer her through the changes of direction, and she did quite well. Session Two: Walk and Trot: Asked her to trot through the changes through the circle, at first she had difficulty maintaining the trot as she changed direction but she soon figured it out. Session Three: Electra had already been ridden in a theater class with a lot of quadrille exercises, so for this session we only walked. This time I walked around the arena, driving straight behind her and kept her straight on the rail and then straight accross the diagonal. She did fine and I had Angela practice driving her and keeping her straight. She did very well driving. I took up the reins and asked Eleckra to do walk pirouettes and she quickly figured it out. I will keep you posted on her progress if anyone is interested, please let me know.